But his 55 on the back was not good enough. 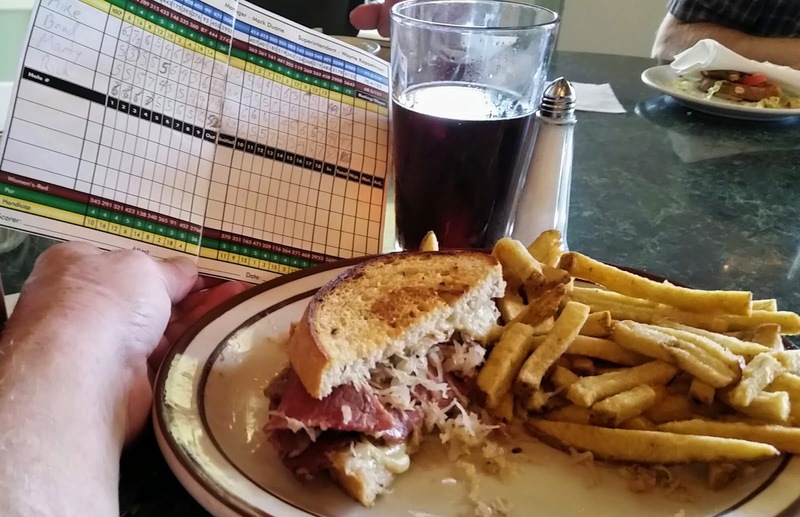 Doug has applied for membership in the bad golfer distribution list. But his 83 may have disqualified him. My glutes are still not firing. 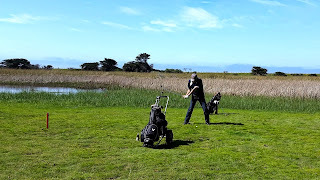 After insisting on playing from the real tee box. 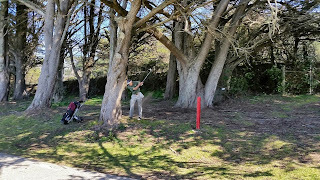 That snowman on 9 killed my front. 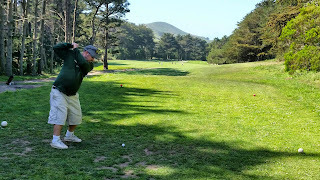 Real golfer Doug says it's okay to include him in the blog. 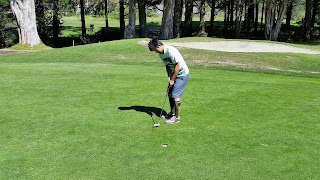 ...and 3 putting for a bogey on 7. A gorgeous day on the coast. We're movin' right along. I waved as it cruised by... Three years later, I finally got around to looking it up on Google Maps, and it's still us from March 2015. I am back-posting these screenshots in 2018, so apparently Google doesn't update Lundy Drive "Street Views" all that often. Just Mike and Other Mike today, as Other Bob proved to be unreliable. 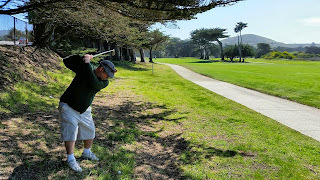 The starter put real golfer Doug with us, so live blogging may be limited. The 9th Circuit has something to say about WEI's appeal of their dismissed Sharp Park lawsuit. 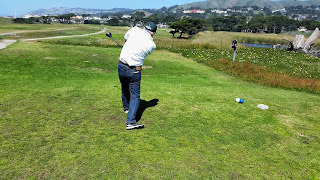 Two weeks ago the United States Court of Appeals for the Ninth Circuit heard oral arguments for a Wild Equity Institute (WEI) appeal of district Judge Susan Illston's December 6, 2012 decision to dismiss the WEI lawsuit against the City of San Francisco and Sharp Park golf course. 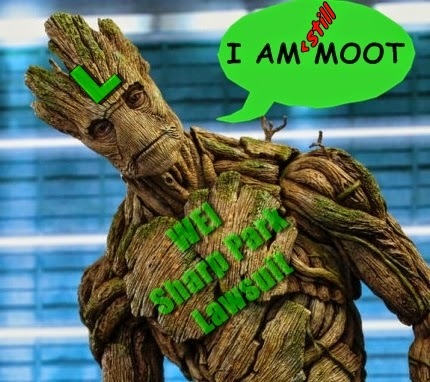 She dismissed the case as "moot". 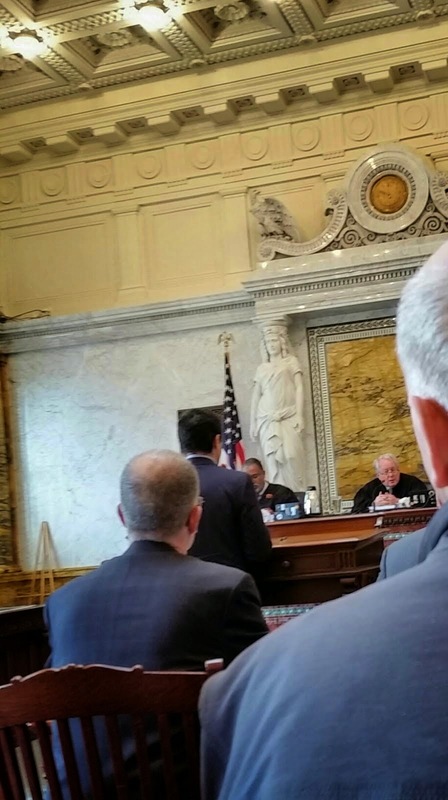 Today the 9th Circuit Court of Appeals rendered their judgement of the WEI appeal. 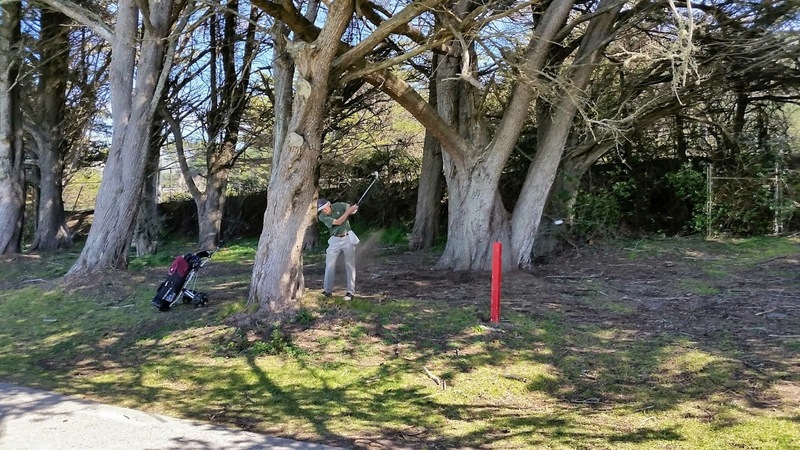 "In this case, in simple terms, the Wild Equity Institute sued the City of San Francisco over whether they had the right permits and permission to continue golf operations, enhance the frog habitat, and provide needed infrastructure maintenance. The judge determined that the City did indeed have the correct permits and permissions, found the WEI lawsuit moot, and dismissed the case. WEI subsequently declared victory, and asked their legal fees to be reimbursed as a reward for managing to successfully get their own lawsuit declared moot. After the judge granted them 1/4 of the legal fees they wanted they issued another triumphant press release. Then they subsequently appealed the judgement of the lawsuit they claimed that they won. For us, the untutored, non-lawyerly, great unwashed, this comes across as complete horseshit." 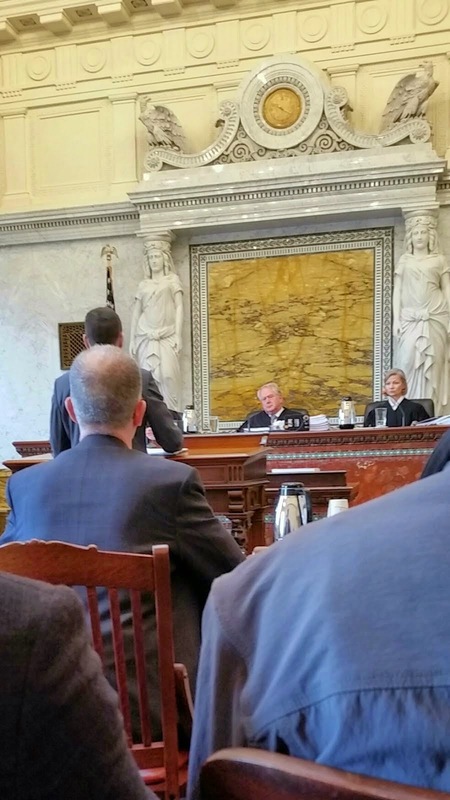 As it turns out, the 9th Circuit Court of Appeals agreed with my assessment. Perhaps the most remarkable aspect of their decision is that it was rendered in only 600 words and less than two weeks after hearing oral arguments. 100 of those 600 words were consumed by the title of the lawsuit and listing the litigants. Cripes, I can't even write a blog post introduction in under 600 words. The issuance of the ITS and CWA permit have also fundamentally changed the legal landscape within which the parties are operating, reducing the likelihood that this issue will arise again between these particular parties... We therefore lack jurisdiction over this appeal. APPEAL DISMISSED." I believe I have become adept at translating legalese into common parlance. Given that this decision was rendered so quickly (2 weeks), and so succinctly (600 words) , and specifically called out as a "memorandum" disposition that is "not appropriate for publication and is not precedent" (i.e. not all that important) - I conclude that the 9th Circuit Court of Appeals disposition of the Wild Equity Institute Appeal can be distilled to: "Why the f**k are you putting this crap in front of us?" 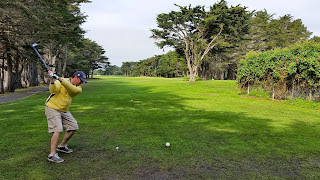 We can't say "thank you" enough for the continuing good work from the San Francisco City Attorney's office led by Dennis Herrera and represented in court by Jim Emery, the San Francisco Public Golf Alliance founded by Richard Harris & Bo Links, and Joseph Palmore from the offices of Morrison & Foerster. On to the next battle. 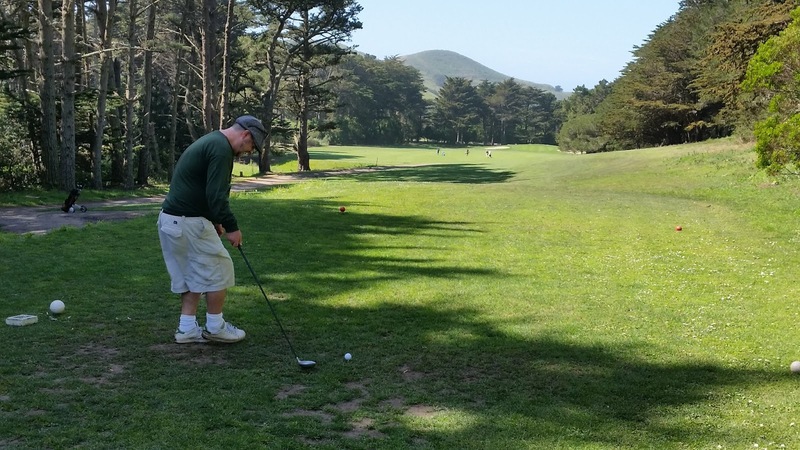 They've lost the political battle with both the Pacifica City Council and the San Francisco Board of Supervisors. They've lost in Federal Court. They've lost in the court of public opinion. Now they are moving to regulatory agencies, specifically the Coastal Commission. The hearing is in two weeks. Onward. 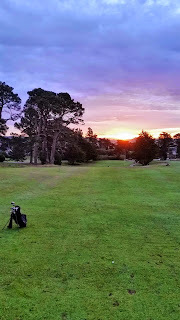 Played the back at Sunrise at Lincoln Park. Wanted to check out the track after the City Championship qualifiers over the weekend. 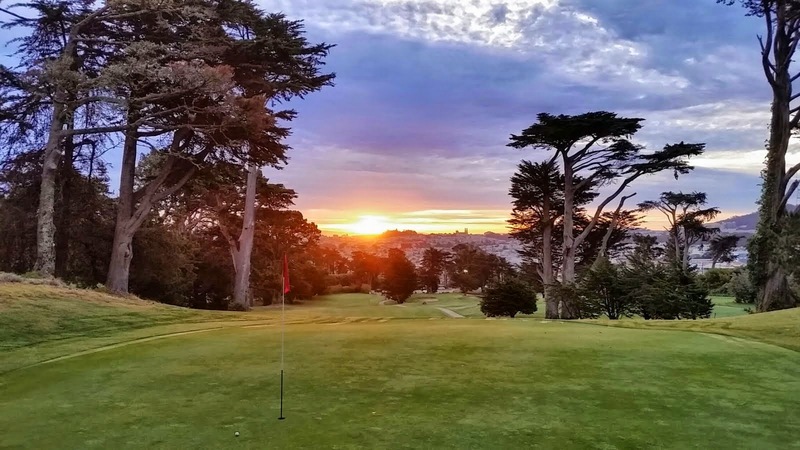 The City Championship is one of the great golf traditions in San Francisco. 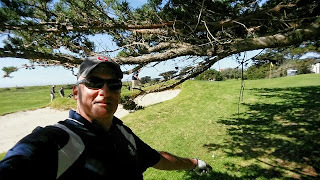 According to Bo Links, it is the oldest consecutively played golf competition in the world. Who knew? 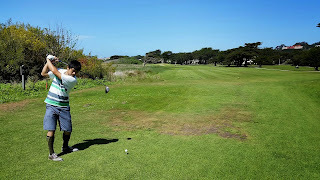 "Although professional golf has come and gone at Harding, it is amateur competition that has kept the legend of this storied links alive. 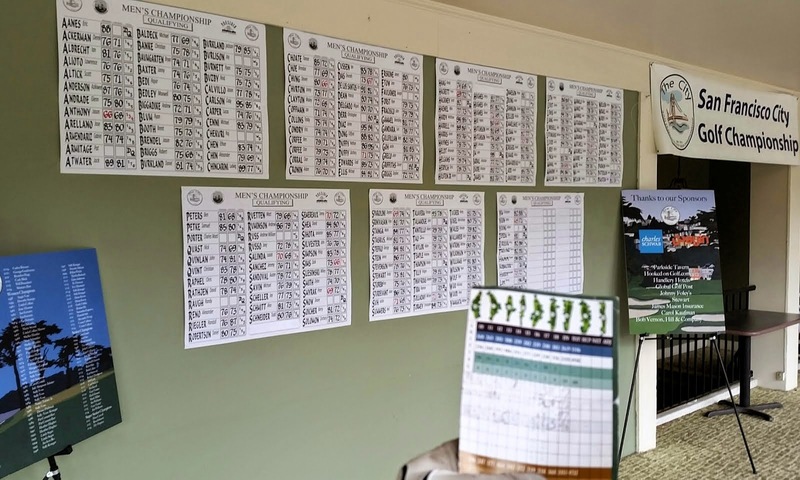 And despite the fact that the national public links championship is the pinnacle for a municipal facility, the two USGA events in 1937 and 1956 are not Harding’s true signature. 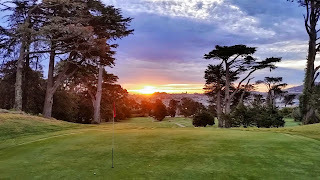 That high honor belongs to the San Francisco City Championship, inaugurated in 1916 with the opening of Lincoln Park, and later shifted over to Harding following its opening in 1925. 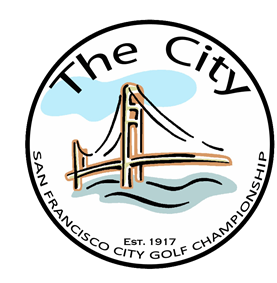 “The City,” as the local championship is known, is the oldest consecutively played competition in the world. 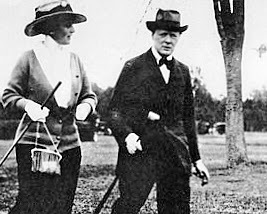 Even the British Open – golf’s oldest championship, which began in 1861 – took time off when the world was at war. So did the U.S. Open, the PGA Championship and the Masters, the other events comprising the modern “Grand Slam.” So did virtually every other major event. Not so, the City. Players have trudged through rain and mud for 86 consecutive years, even while American troops were engaged on foreign battlefields." Comparing my 46 from the blues to some of the qualifying scores. that is the Sharp Park legal question. The latest battle in the Sharp Park Golf War took place at the 9th Circuit Court of Appeals in San Francisco on Wednesday, March 11. The plaintiffs for the underlying lawsuit that was dismissed as "moot" in Judge Susan Illston's district court included the usual suspects from the WEBLEEDU Axis. Neither Center for Biological Diversity nor Sierra Club lawyers were evident for this appeal of the "mootiness" of their common complaint. Wild Equity Institute stood alone at the bar. 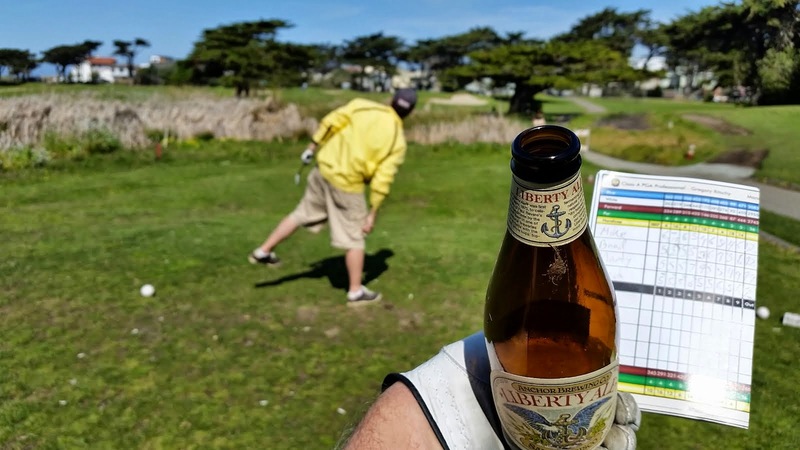 We need a scorecard to keep track of all the lawyers involved in the never-ending story of the Golf War. It all started with lawyers from the Tucson-based Center for Biological Diversity (CBD), who can be credited with exploiting the unintended consequences found at the intersection of the Equal Access to Justice Act (EAJA) and the Endangered Species Act (ESA). This organization built the model for the lucrative eco-litigation racket which has since been emulated by many enviro-activist law firms across the country. 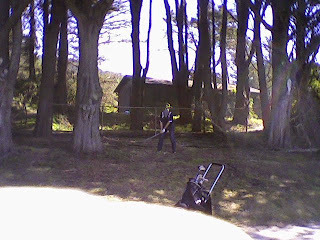 As noted, the opening volley in The Sharp Park Golf War was fired by CBD in 2008 when they threatened to sue the City over Sharp Park golf operations. In 2009 a CBD staff attorney founded a "mini-me" clone of CBD in the Bay Area - The Wild Equity Institute (WEI). He's taken the lead on filing Sharp Park lawsuits ever since, collecting reimbursable billable hours from the City along the way. It's a simple business proposition. The more lawsuits they file, the more he gets paid. Paid by taxpayers. By us. 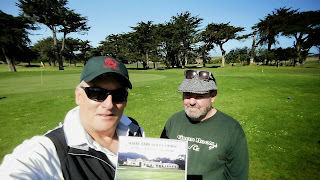 Standing with practical environmentalists, preservationists, and golfers working for and with the City to improve both the species habitat and the course: the San Francisco City Attorney's office led by Dennis Herrera and represented in court by Jim Emery; the San Francisco Public Golf Alliance founded by Richard Harris & Bo Links and represented by Joseph Palmore from the offices of Morrison & Foerster. The City attorneys are, of course, on the city payroll. 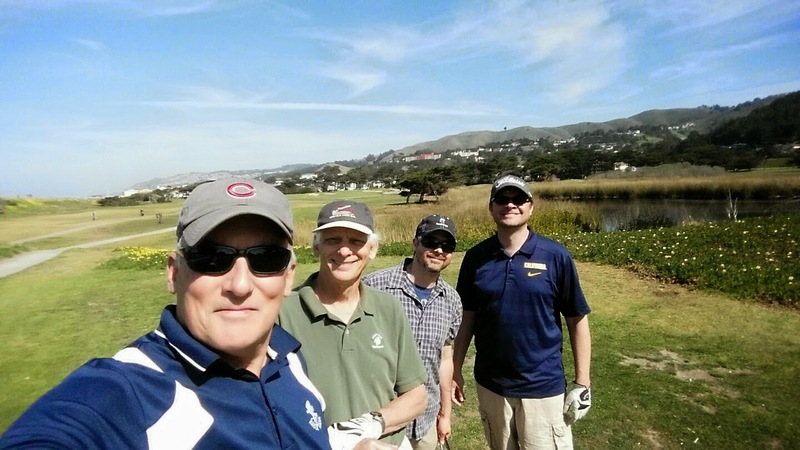 The SFPGA and MoFo attorneys are working pro bono. Which, for us non-lawyers, means they are working the case for free. 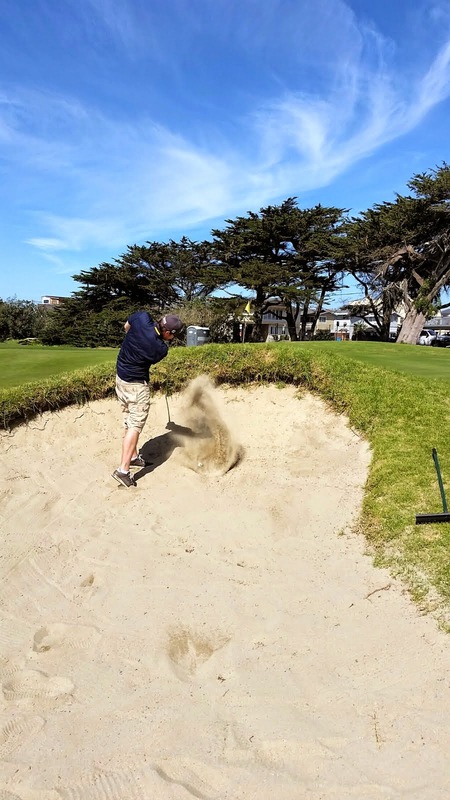 They are doing this because they believe in the cause of protecting and preserving the civic jewel that is the Sharp Park golf course and the important historical legacy the course represents. The three judge panel will render their verdict whenever they get around to it. 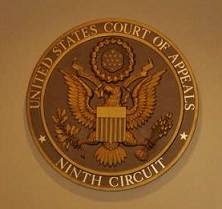 I won't pretend to be able to assess the legal minutiae argued in the proceedings or predict how the 9th Circuit will rule on the appeal. Those of us of the non-lawyerish persuasion are forced to rely on common sense and simple language to sort out the difference between a reasonable argument and complete horseshit. In this case, in simple terms, we understand that the Wild Equity Institute sued the City of San Francisco over whether they had the right permits to continue golf operations, enhance the frog habitat, and provide needed infrastructure maintenance. The judge determined that the City did indeed have the correct permits and permissions, found the WEI lawsuit moot, and dismissed the case. WEI subsequently declared victory, and asked their legal fees to be reimbursed as a reward for managing to successfully get their own lawsuit declared moot. After the judge granted them 1/4 of the legal fees they wanted they issued another triumphant press release. Then they subsequently appealed the judgement of the lawsuit they claimed that they won. For us, the untutored, non-lawyerly, great unwashed, this comes across as complete horseshit. "Wild Equity wants to have its cake and eat it, too; it brought a lawsuit alleging that the City was engaged in take without incidental take authorization. 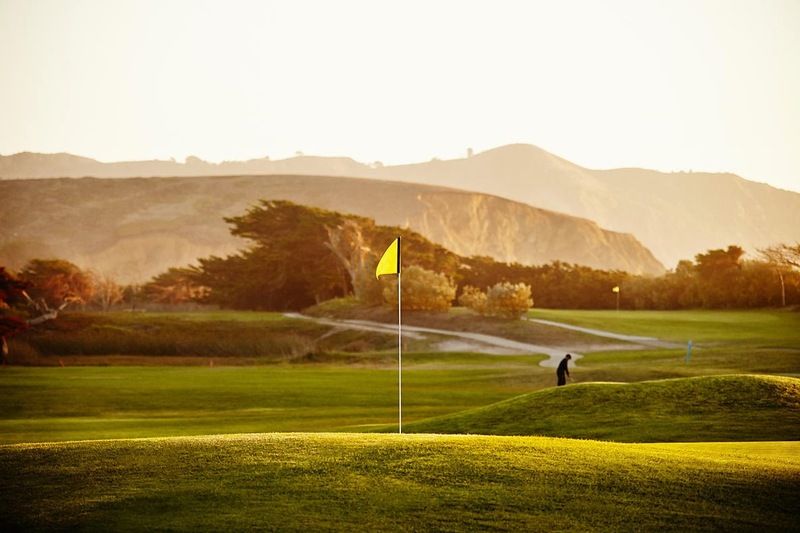 After the City obtained the BiOp and ITS, Wild Equity sought attorneys’ fees on the theory that it had obtained its litigation objectives, namely, requiring the City to obtain an ESA permit for continued Golf Course operations. Wild Equity’s motion for attorneys’ fees repeatedly asserts that the BiOp and ITS are binding, and that the City was legally obligated to comply with ITS terms and conditions. Now, however, Wild Equity has reversed course and contends that the City’s compliance was and is voluntary, and that the City did not become legally bound by the ITS’s terms and conditions upon issuance of the BiOp. So, when arguing for attorneys’ fees Wild Equity claimed its efforts directly led to the City’s being bound by the requirements of the BiOp and ITS upon issuance. Now, when seeking to resuscitate its moot claims Wild Equity insists the ITS terms and conditions were merely voluntary. This argument is a familiar one—Wild Equity first raised it in its motion to dismiss briefing before the District Court, SER 0070-72, and then abandoned it in its motion for fees. Notwithstanding Wild Equity’s inconsistent contentions, as demonstrated above, City compliance with the ITS became mandatory at the moment the ITS was issued. 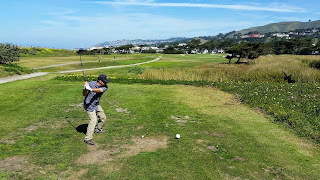 As the District Court correctly recognized, any take that occurs if the City fails to abide by the ITS’s terms and conditions for ongoing Golf Course Maintenance and Operations activities will immediately be subject to enforcement action by the Service, and Wild Equity could bring a new ESA citizen suit against the City for those violations. Events subsequent to the filing of this action (i.e., the Service’s issuance of a BiOp and ITS) resolved the dispute, and the case immediately became moot at that time." No matter what the language, the conclusion is the same. Horseshit. 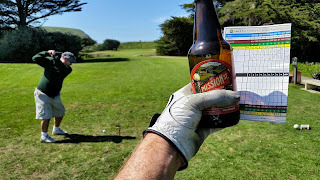 UPDATE: The verdict is in: "Moot Squared"
Readers who have followed the twists and turns of the on-going Sharp Park Golf War may recall the WEBLEEDU Axis (Wildly Equitable Biodiverse Litigants for Ecological Extortion and Deep Untruths) had their federal lawsuit to curtail golf operations at Sharp Park dismissed in December, 2012. 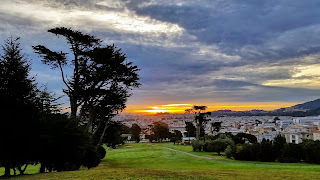 Subsequently in March, 2014 they lost the vote on a San Francisco Board of Supervisors resolution intended to sabotage needed Sharp Park habitat and infrastructure improvements. 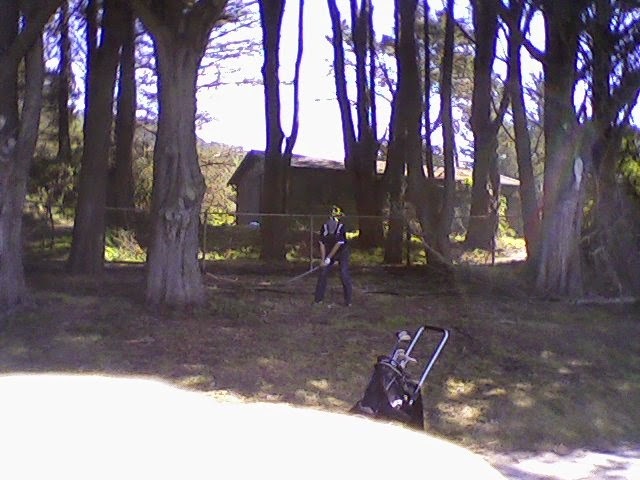 Since then Sharp Park has not been in the news much, but that is about to change. Time to get caught up. "The Federal 9th Circuit Court of Appeals will hear oral arguments on March 11 regarding U.S. District Judge Susan Illston's decision to dismiss the endangered species lawsuit filed by Wild Equity Institute and other environmentalist groups. Judge Illston in December, 2012 declared the case moot after the U.S. 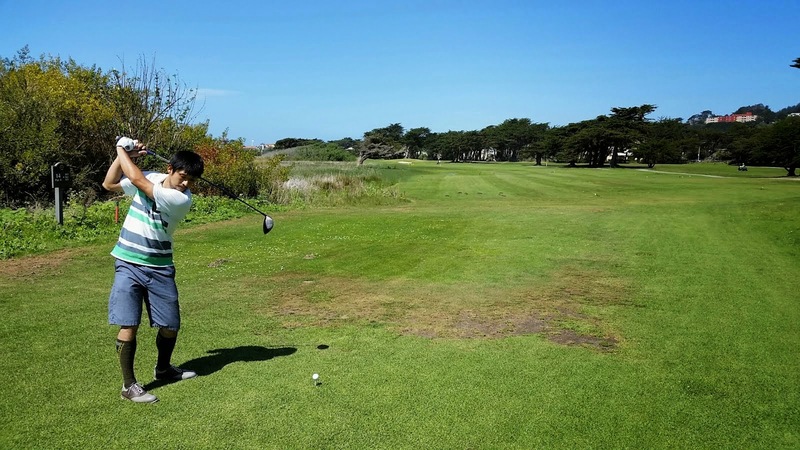 Fish and Wildlife Service issued its Biological Opinion that expressly permits continued operation of the golf course and mandates various other actions to protect the California red-legged frog and San Francisco Garter Snake. The case is Wild Equity Institute vs. City and County of San Francisco, No. 13-15046. 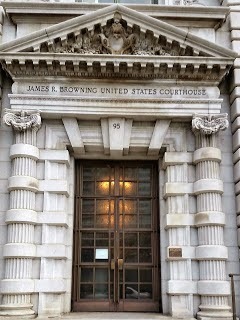 Oral argument will be held in the 9th Circuit Courthouse, 95 7th St. (NE corner of 7th St. and Mission), San Francisco, Courtroom 2 (Third Floor, Room 330), at 9:00 AM before an appellate panel of Judges William J. Fletcher, Andre Davis (a judge from the 4th Circuit U.S. Court of Appeals), and Morgan Christen." Let's review. In March 2011 WEI et. al. sued the City in federal court over golf operations at Sharp. In December 2012 Judge Susan Illston dismissed the lawsuit, prompting an Orwellian post at WEI explaining that by having their lawsuit dismissed they actually won. Whatever. They subsequently petitioned the court to have the City of San Francisco reimburse them $1.3 million in legal fees which they supposedly expended in the dismissed lawsuit against the City of San Francisco. Really. That happened. Ultimately the judge did award the plaintiffs $386,000 in fees, or about 25% of the "billable hours" they claimed. 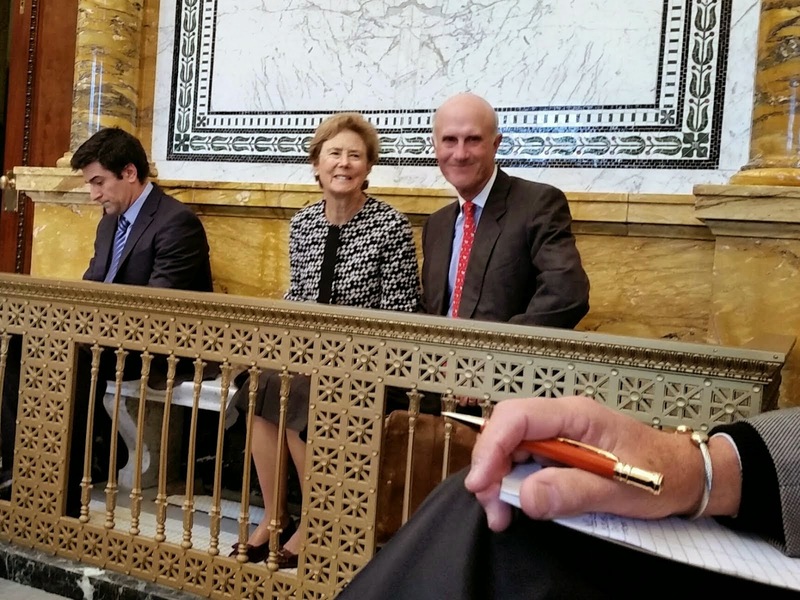 Subsequently, WEI filed an appeal against Judge Illston's decision to dismiss their suit. Oral arguments are on Wednesday. It will be interesting to hear why they need to appeal a ruling they claimed they "won". It's now four years on since their initial lawsuit. 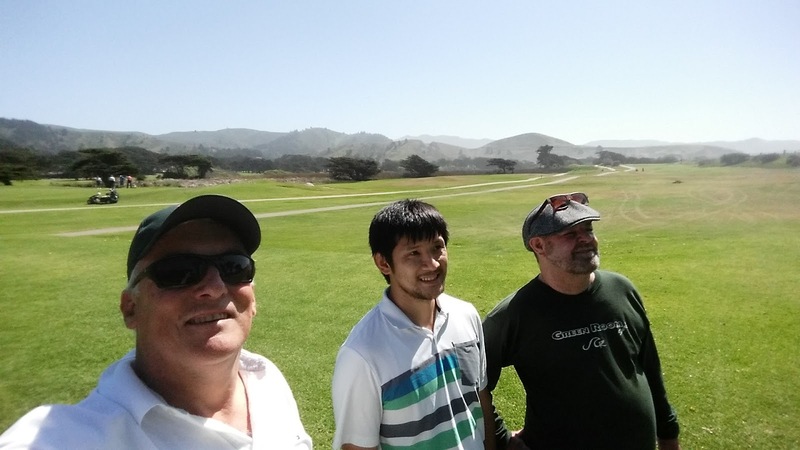 Four years of delaying what scientists, practical environmentalists and government agencies know will improve the managed endangered frog and snake habitat at Sharp Park. Four years of WEI continuing to pile up "reimbursable" billable hours. You can't say I didn't warn you. Stay tuned. 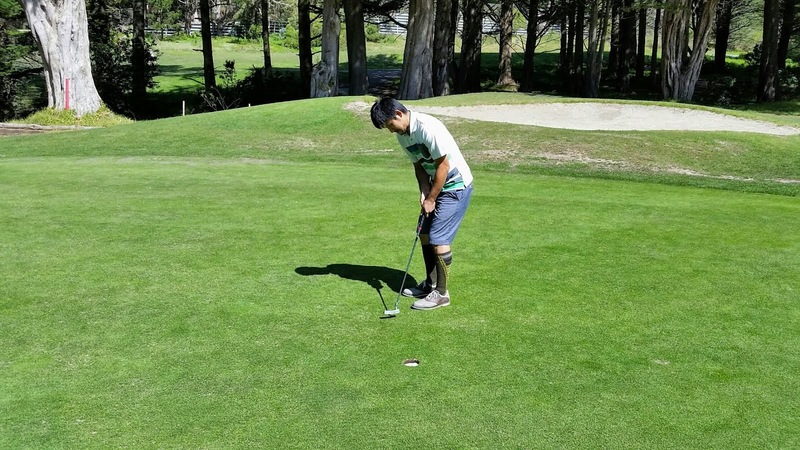 ITEM: WEI discovers the concept of "winter"
Last December, WEI highlighted a video clip of flooding at Sharp Park during one of the worst storms the region has seen in years. Apparently WEI is completely unfamiliar with the concept of "winter". 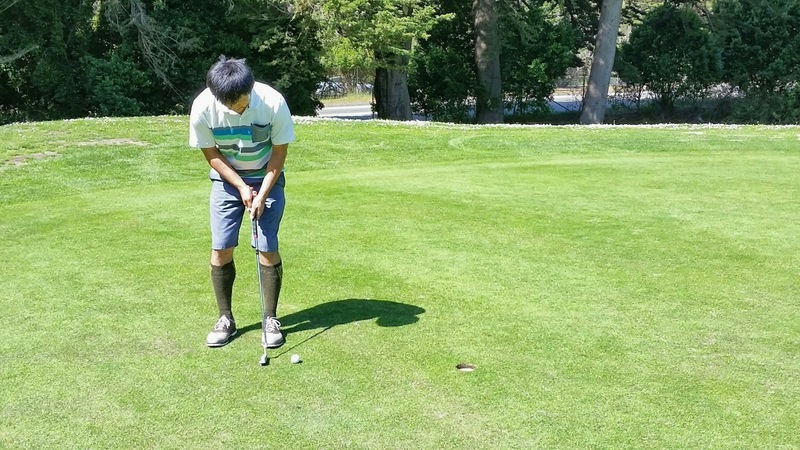 Golf courses are outdoor venues and, of course, subject to the vagaries of weather. 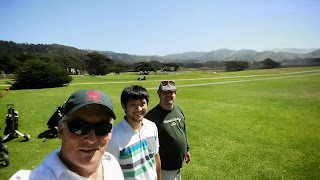 WEI may be surprised to learn that many golf courses not located in tropical climes actually close completely for "winter". Even tropical venues close for extreme weather events. 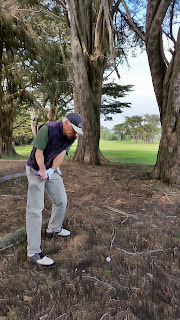 So it is not surprising that Sharp Park closes some or all of the course for days or weeks during "winter" depending on conditions. 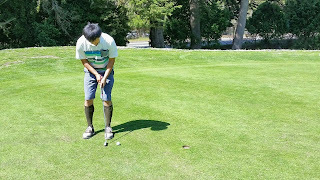 For the benefit of WEI, this is called "normal golf operations". The same kind of common sense management you would see at any course in the world. Par for the course, so to speak. ITEM: The San Francisco Public Golf Alliance has a new website. "We've given our website a facelift! The old website served us well in our early years as a grassroots movement defending our San Francisco municipal golf course civic gems from the misguided and misinformed who seek to destroy them. The battle for Sharp Park is not over. We need to defend against appeals pending in the courts, support needed infrastructure renovations, push for habitat restoration, persuade our civic leaders, and correct disinformation from disingenuous opponents promoting misleading PR campaigns. We hope this new, improved, more accessible website will help galvanize our supporters and better engage and inform the public about our mission. Help us get out the word about our new site and support our mission. Please - Like us on Facebook! Follow us on Twitter! Link us on LinkedIn! Like our pictures on Instagram! The more social media support we get from you, the bigger the impact we can have as an organization." They've done great work defending a great course and deserve our support. 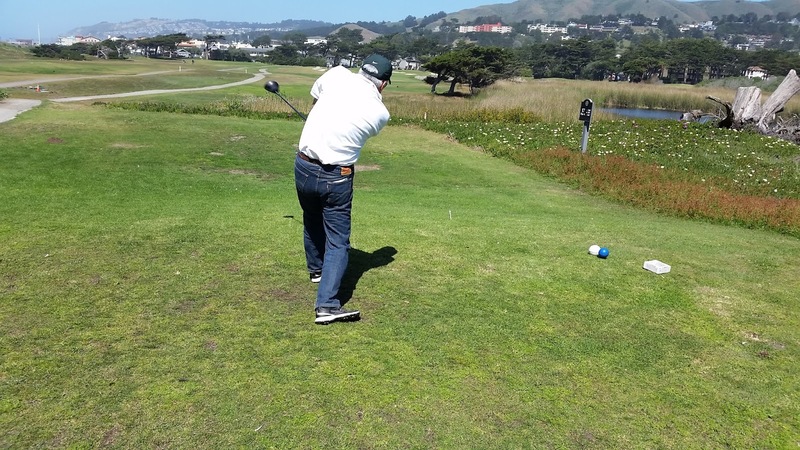 Follow them on social media, donate to the cause, and play in the 2015 Alister MacKenzie Tournament for Sharp Park. 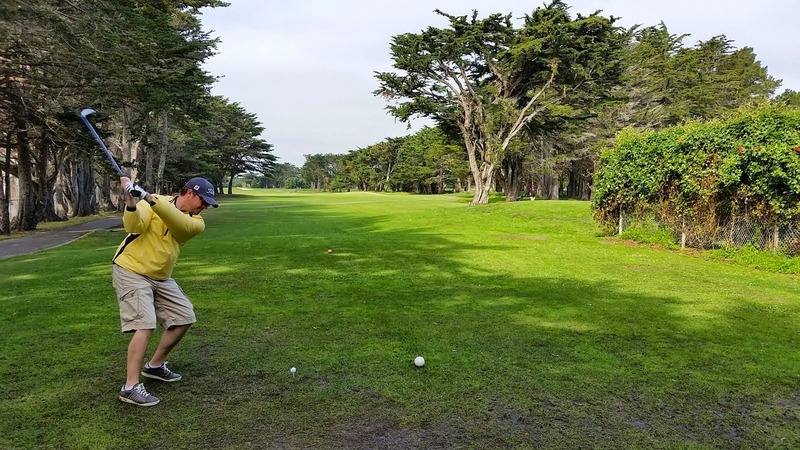 The San Francisco Public Golf Alliance will continue to fight the good fight to protect this important historic legacy for future generations of San Franciscans, Pacificans, preservationists and golfers the world over. 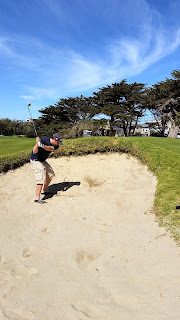 "We shall defend our golf course, whatever the cost may be, we shall fight in the courts, we shall fight at City Hall, we shall fight in the fairways and on the greens, we shall fight in the pot bunkers, we shall never surrender." 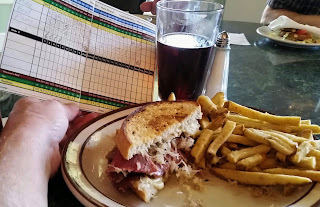 Rueben at Sharp Park clubhouse is highly recommended. So close and yet so far. I may be on the verge of breakthrough. He spent a lot of time among the trees today. ...eventually. We mercifully agreed on an asterik. The tree next to the 15th green gave me back my ball. This doesn't always happen. Out of gratitude I left an offering of beer spilled near the tree's roots. ...barely. No frogs were harmed in the completion of this round. The marshall is urging us along and blog updates are suffering. 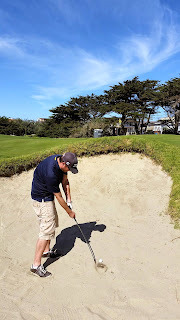 The less said about this hole the better.